Celebrate the Rhythm of Life: For a Season of Epiphany! For a little perspective on the Epiphany and Three Kings Day within the rhythm of the Christian year. Today January 6th is the Feast of the Epiphany also known as Three Kings Day. It follows Twelfth Night, the last of the Twelve days and Holy Nights of Christmas. This celebration is of the Epiphany. 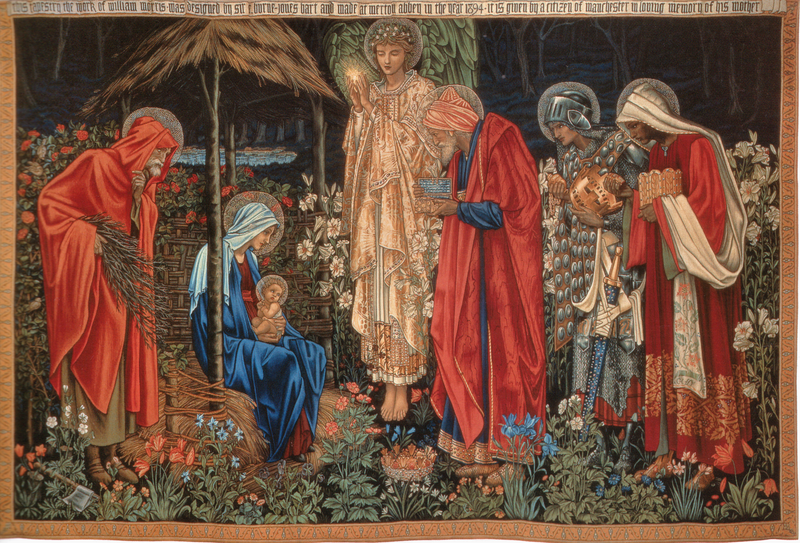 The word "epiphany" mean "to reveal, to appear, to manifest" and from "above." It was the great star in the sky that was not a star at all that brought the three kings from afar in search of the new king, the child of light. For this reason, stars are a symbol of this celebration. Twelfth Night is the culmination of the twelve days of Christmas as well as the Twelve Holy Nights. While the Epiphany and Three Kings day marks the start of Carnival which lasts until Mardi Gras, an occasion for great celebration with parades, music, dancing and another King’s Cake, this one with a bean or baby Jesus tucked inside. Baby Jesus you exclaim? Yes, the Kings were seeking the baby Jesus, thus a baby Jesus tucked inside for seeking. Some people use a trinket instead. In France the bean is a lava bean and known as "le feve." Epiphany is seen by some to herald the end of the Christmas season. Yet others today and throughout history look to Candelmas on the 2nd of February to mark the end of Christmas. In Medieval times greens were kept in the house until Candlemas. Candelmas is the Celebration of the Light of the World, more here. Epiphany may be embraced as a four week season balancing the season of Advent with the Twelve Days of Christmas in the center. Four weeks of anticipation, moving towards and four weeks of awakening, digesting and assimilating that which has come to us. The celebration of Epiphany is a heavily loaded one for it encompasses the arrival of the Three Kings from the East bearing gold, frankincense and myrrh, each one coming from a different place, each one heralded on by the appearance of a star. Mardi Gras, the last hurrah before Lent, is also about the Three Kings. The colors of Mardi Gras are gold, green and purple. In New Orleans, many floats are led by three kings on horseback showering gifts of purple, green and gold coins, beads and trinkets. The purple is for Myrhh, a reddish purplish brown resin, green for Frankinsence, a light green resin from the Boswellia tree and gold, the gifts the Magi brought. Rudolf Steiner who brought forth Waldorf education, stated "Festivals are not merely the commemoration of historical events or personalities. They are in and of themselves, each year, spiritual events carrying a significance that grows and deepens with the developing phases of human evolution." More on celebrating Three Kings Day is available in the Celebrate the Rhythm of Life in January group here.